The layering of chords, with inner roots and strong voice leading are an important part of linear harmony; it’s a melodic way of writing with chords, and with apologies to Schoenberg and Debussy, a jazzy way of using “Klangfarbenmelodie”, or “timbre-structures”, or “sound-color-melody”. I’ve used my tune “Take it Inside” in a previous post to show linear harmony composition techniques. I want to explore some more of the details of writing music that implies layers of chord structures. Remember that linear structures/chords/counterpoint may be harmonically non-functional–the normal rules may not apply. Example 1 shows a distillation the tune’s main progression. This “white key” modal texture forms the background harmonic layer. Ex. 1) Chords above and bass line below – this is the the progression from the first few bars of “Take it Inside”. What’s important is that the bassline moves while the chord structures above are static. The pickups (to the F/E, Db/F and Fmaj7 chords) show you where the strong measures are, where the next chord phrase begins. The effect is a wash of white keys above, with a bass that has strong linear movement. While the rhythm section repeats the above chord phrase, the horns have figures that move in and out of the hazy tonality–I wouldn’t say that you can hear these chords once it gets going, especially if the bass player improvises and doesn’t always play the bass notes indicated. Plus the piano player’s voicings will probably be much different from the simple version above, and this will add to the haze and fog. With the horns playing increasingly dissonant and non-conforming lines and phrases as the piece evolves, we might lose our ability to hear traditional chord progressions and even chords. This effect will be heightened if the rhythm section starts to play more “out”. Ex. 2) Fairly straight-ahead lines on top with a strong moving line in the middle. Think of it as a three-part texture, including the bass note. Any chords are implied, and there are notes outside of the scale that one might expect. Ex. 3) I would expect the piano player to hear chromatic, dissonant notes, and play more “outside”. The background harmony is devolving and the contrapuntal, linear texture is taking over. Ex. 4) Strong downward motion by the lower voice, and chord-like intervals create an inner harmony with a life of its own. The strong inside line attracts your ear–t’s what might be called a power tone or guide tone line in traditional jazz harmony, or a suspension in classical-speak. In the examples below this inside line pulls focus, and you may start to hear it as the bottom of the chord; we naturally compare what’s above with what’s below, and the sound of what’s above can change in an instant depending on the line underneath. Strong voice leading holds it together. The layering of chords, with inner roots and strong voice leading are an important part of linear harmony; it’s a melodic way of writing with chords, and with apologies to Schoenberg and Debussy, a jazzy way to invoke what Schoenberg termed Klangfarbenmelodie, or “timbre-structures”, or “sound-color-melody”. I think this is something I think we do naturally by ear when we start layering harmony by improvising with chords. Think of playing a low note on the piano, holding it in the pedal, or in your ear, then jumping up and play something in the midrange, then back to the bass for a new note. You can usually make anything work, including weird dissonances. as long as everything is melodic. Along the way, you may start to see some inner structures that resemble and sound like chords. 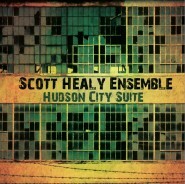 Gallery | This entry was posted in Arranging/Orchestration, Harmony, Jazz Arranging, Jazz Composition and Analysis, Jazz Theory, Linear Harmony, Theory and Harmony and tagged arranging, composition, jazz composition, jazz theory, linear harmony, music theory, scott healy. Bookmark the permalink.